One summer my mom and dad packed our car for a long trip. “Where are we going?” I asked. “Are we going to the beach?” “No,” said Dad. “Are we going to Grandma’s house?” “No,” said Mom. “Are we going to the mountains?” I asked. “Yes,” said Mom. “But we are not going to just any mountains. We are going to follow the pioneers’ trail to the Rocky Mountains.” “Oh,” I said. 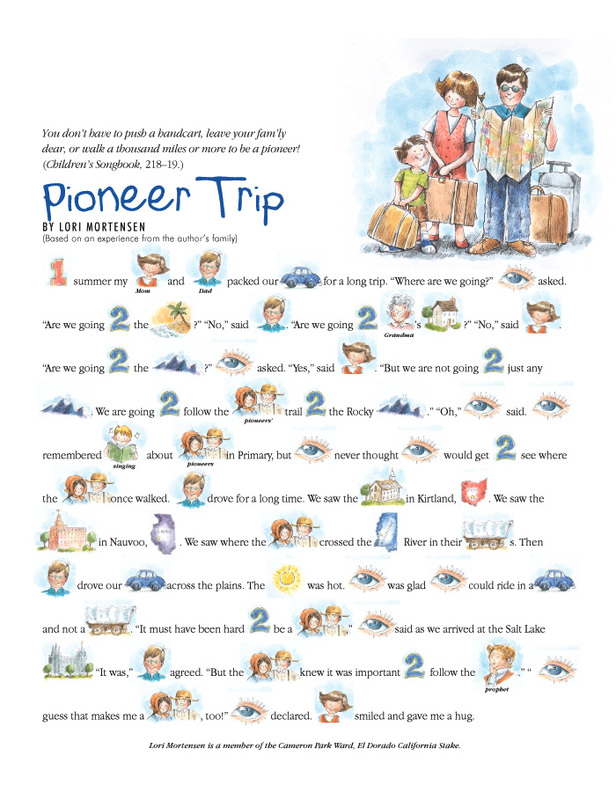 I remembered singing about pioneers in Primary, but I never thought I would get to see where the pioneers once walked. Dad drove for a long time. We saw the temple in Kirtland, Ohio. We saw the temple in Nauvoo, Illinois. We saw where the pioneers crossed the Mississippi River in their wagons. Then Dad drove our car across the plains. The sun was hot. I was glad I could ride in a car and not a wagon. “It must have been hard to be a pioneer,” I said as we arrived at the Salt Lake Temple. “It was,” Dad agreed. “But the pioneers knew it was important to follow the prophet.” “I guess that makes me a pioneer, too!” I declared. Mom smiled and gave me a hug.